"Welcome to the million star hotel!" our guide exclaimed. Twelve of us were sitting at a table on top of long, wood planks, floating in Chiew Larn Lake among a line of small floating bungalows. We had recently arrived via a long-tail boat ride and were settling into our home for the next 24 hours. "You've heard of two-star and three-star hotels, right? Well, this is a million star hotel. You will see once it gets dark. There will be a million stars out." Our guide, "A," could have been customizing the tour to Dave and me. Not only did he drive us along this beautiful, emerald green lake, but now the talk of stars had us hooked. One of the things we miss most about this year away is spending time in Yosemite and other favorite parks in California. Luckily for us, being in Khao Sok quickly brought back memories of the mountains and we felt immediately at home. Chiew Larn Lake could easily be what the Yosemite Valley would look like if it were dammed and flooded. It's hard to remember how we found Khao Sok among our search for things to do in Thailand, but we quickly agreed to travel there when we read about the park, its jungle and its large lake. After an adventurous travel day, we arrived in Khao Sok and spent the first night in a tree house at Khao Sok Paradise Resort. 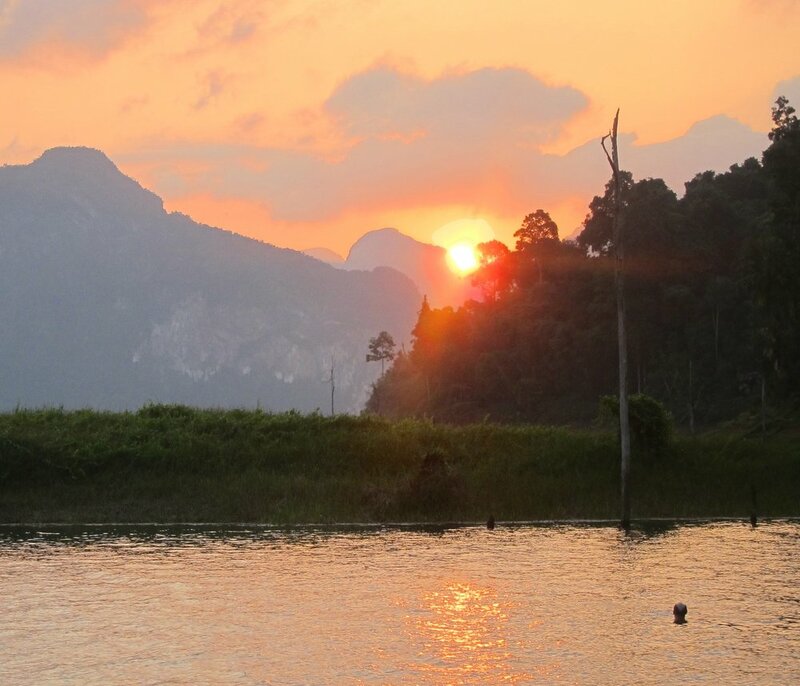 The next day we had booked an overnight tour to Chiew Larn Lake, which included a boat ride, hiking, cave exploration and a night spent on a floating bungalow. Chiew Larn Lake is a man-made lake, built by a dam created by the Electricity Generating Authority of Thailand in 1982. The dam created a 165 square km lake that is unmatched in beauty by many lakes I have seen. Limestone outcrops rise out of the water and create a dramatic backdrop and amazing 360 degree views while boating along the lake. The lake tour included time to swim in the warm water, kayak along the shores, chat with fellow travelers and join our guide for a jungle trek to a mountain view point and a cave tour that is a cornerstone of tourist visits to the lake. As our hotel manager explained to us, "It's a cave full of spiders, snakes and bats and at some points you have to swim through it." Why wouldn't that be something we would want to experience? After a lazy afternoon of swimming and lounging, we hopped back in the boat for a trek through the jungle and up to a mountain view point. Jungle hiking is unique - the sounds you hear in the trees and the bugs you encounter along the way are not ones we are accustomed to in the States. Khao Sok is also home to land-based leeches. The leeches sit under leaves and attack unsuspecting hikers when the leaves are disturbed. They are not dangerous or carry disease, just cause bloody socks, pants and legs for the poor souls who become their victims. Dave and I escaped three hikes unscathed by leeches, but some of our fellow hikers weren't so lucky. After an hour and a half of uphill hiking and rock climbing, we reached a view point high above the lake. It was well worth the huffing, puffing and sweating endured to get there, especially with the knowledge that so few people actually make this trek. "A" had brought a fruit native to the area called Rambutan, which resembles a lychee. They were a welcome treat after the effort we put in getting up the mountain. I was anxious about the cave hike the minute I heard about the animals lurking in its shadows and was grateful that we were leaving it for the second day of our overnight trip so I could continue to mentally prepare myself. All the other guests on our tour didn't seem nervous about it, so I resigned myself to making the trek with the group. In the morning, we hopped back in the boat and cruised along the lake to reach Tone Teuy Creek, which is the arm of the lake's cave dwelling hikes. Along the way we saw monkeys swinging from branch to branch in a tree - another stark reminder that we were in the middle of a jungle. The hike to the mouth of the cave was unassuming and mostly flat (a nice change from the hike the day before). Our group had gotten an early start so there were few others on the trail. As we reached the mouth of Nam Talu Cave, my nerves started to increase but there was no turning back now. We put our headlamps on and headed in. It started out easy and interesting. We walked through a shallow stream and saw some of the cave's stalactites and stalagmites. Shortly, we turned a corner and were being viewed from above by hundreds of bats. We turned to our right as our guide pointed out a group of spiders, including a large tarantula. The people on our tour were captivated by the bats and spiders. Camera flashes continued going off and all I could think is that one of the flashes would scare the bats enough and they would start flying out at us. A few did, but were relatively harmless. The cave's formations were really interesting and when not surrounded by creatures, I was actually enjoying it. We forded a few streams and eventually handed over all cameras to our guide for safe keeping - we were nearing the deep water. A very narrow passage way led to a drop off. I heard the guide yelling to the person in the front to just jump into the water. My turn came and I balanced on a few rocks as I let myself down to the deeper water. We were in water up to our waist and quickly found the next drop. A rope was secured to the rocks to help us down and soon I found myself in water up to my neck. The movie Goonies was playing in my head and I half wondered if we were in search of One-Eyed Willie's treasure. The girl in front of me flashed her light in the water and both her and Dave said, "snake!" at the same time. I unabashedly give the girl a little push to move quicker and after about 100 more meters, we saw light and exited the cave. I gave Dave a high five, wrung out my shirt and said a little prayer of thanks. Our guide didn't lead us astray in our two days. I always felt safe during our adventures and when the sun went down and the stars filled the sky, we sat and soaked in the million star hotel. On our last day, we rounded out our time in Khao Sok with a hike near the main entrance of the park. The majority of hotels in Khao Sok line the road to the park entrance and we had a quick 15-minute walk to reach the main trails. The park is mostly jungle and our hikes deeper into the trails proved challenging as we scaled over large tree roots and boulders. Again we got an early start so were the first ones on the back trails that morning. A rustling in the brush below revealed a wild pig who was more scared to see us than us to see him - he bolted the minute he saw us. (My heart was racing - the pig was as large as a bear and at first, I thought it was an Asian black bear). Jungle hiking is hot and humid and we were so happy to come across a concession stand on our hike back. Grabbing two Chang beers and a Coke, we continued on our hike only to quickly come across a pack of at least 10 Langur Monkeys in the bamboo trees above us. We happily took a break, finished our beers and watched the monkeys fly across the bamboo branches. In three days, we saw more than we could have asked for. Animals, amazing scenery, an incredible lake and jungle paradise surrounded us constantly (and wiped us out each day so a good night's sleep was easy to come by). Khao Sok is still a hidden gem in Thailand. The biggest national park in Southern Thailand is definitely worth a visit. -Take the public bus from Surat Thani to the bus stop at Khao Sok. It will be much cheaper and the bus stop is easy to spot. Taxis wait at the stop to take you to your hotel or you can walk down the road on your own. -Eat at Pawn's Restaurant - the best Thai food we have had so far on the trip. The food is delicious, cheap and the restaurant is clean. -Ask for more information about the bungalows if you are doing the lake trip. The national park owned bungalows look to be in pretty bad shape and the bathroom facilities aren't great. We stayed at the bungalows owned by Smiley Lake and while spartan, they had a bathroom in each individual bungalow. -If you want to really get some luxury on the lake, opt for a nicer bungalow at a resort like Keeree Warin. We stopped there to get beer one afternoon since our restaurant was out and the accommodations looked really nice (you'll pay more for it though! ).